Condition is Used. Fully tested. Do not confuse my low prices with low quality. Bose FreeSpace 51 Outdoor Speakers - Green. Condition is Used. Shipped with USPS Parcel Select Ground. I am the original owner. These speakers were bought brand new in 2015 . They have minimal use, seasonal use, 3 months out of the year. The speakers have been cleaned, wiped down and in good condition. This auction is for 15 speakers that can be purchased individually for the buy it now price.
' ' ---Heavy Duty MDF Construction w/ Reinforced Corners ---5" x 12" Super Horn Midrange/ Tweeter ---1.5" Titanium Compression Driver Loaded in Horn ---Four Piezo Tweeters ---2 x 12" Subwooofer 2" Kapton VC ---Woofer Magnet Weight: 80 oz ---Compression Tweeter Magnet Weight: 20 oz ---Ported Enclousure for Added Bass Response ---Heavy Duty Handles for Easy Portability ---Dual Speakon Dual 1/4" Jacks ---Binding Post Terminals ---Built in Crossover Network ---Power Handling: 800Watts RMS/ 1600 Watts Peak ---Frequency Response: 50-20K Hz ---Sensitivity (1w/1m): 98dB ---Impedance: 8 Ohms ---Dimensions: 16" (W) x 15.2" (D) x 44.2" (H) ---Sold as: Unit ---Weight: 58.3 lbs. Constance Audio brand new speakers. All wood, Very heavy, include spikes. 3 colors, black, red wood and yellow, one pictured. I have 2 pairs of each color, 12 total. 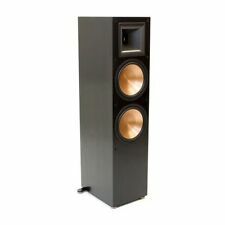 New ListingGoldenear Triton 7 Floorstanding Speakers-Perfect Condition! Highly acclaimed by every reveiw out there on the web! Sony - Core Series Dual 5" 3-Way Floorstanding Speaker (Each) - Black. Sony Core Series Dual 5" 3-Way Floorstanding Speaker (1 speaker). Speaker Type: Floorstanding. Along with a clothe grille net provides durability. Direct/Reflecting Loudspeaker. Tweeter : 3" x (2). Woofer : 10". Condition: Very good overall condition. Speakers will show typical signs of scuffs/scratches from use/storage. We want your item to arrive promptly and safely. 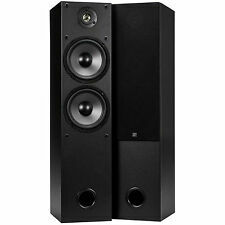 PSB Image T5 Floorstanding Full Range Speakers (pair). Sound amazing. Has minor cosmetic damage from initial shipping. The speaker foam is starting to degrade a bit, but has held up very well considering their age. These towers are rated at a max of 270W @ 8 ohms. 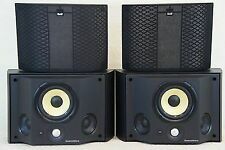 Monitor Audio RS 6 Speakers in mint condition, rosenut. Beautiful cabinets and sound. Excellent clarity, soundstage and depth. Price per speaker. Pre-owned and in good condition. I have them hooked up right now as I'm typing this out and they sound great! They would make a great addition to anyones setup! See pictures for all condition concerns. 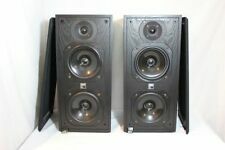 Monitor Audio Bronze Series - BR5 Tower Speakers - Used Condition (1 Pair). Black Color. Condition is Used with great sound. (two speakers total). Dali Oberon 5 Light Oak Floorstanding Speakers. Like new condition. DALI OBERON 5 SPECS. Sensitivity (2,83 V/1 m) [dB] 88. Frequency Range ( /-3 dB) [Hz] 39 - 26,000. Connection Input Single Wire. Weight [kg] 10.8. It's stronger now than originally. 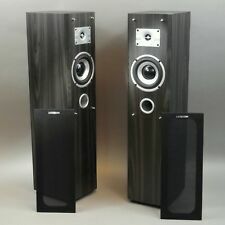 I would still use sub for the movies, but for 2 channel stereo IMO two of these speakers should satisfy most listeners. Very musical speakers and I would compare their sound to the Vienna Acoustics Bach Grand speakers but Pioneers can get louder with proper amp. Bose Powered Subwoofer LSPS series iii. Condition is Used. Shipped with FedEx Ground or FedEx Home Delivery. Floorstanding speakers and subwoofers allow you to augment the audio from your music or television system. There are different configurations available depending on the amount of space and needs. Here are some questions that may come up when selecting floor standing speakers. 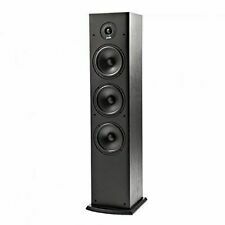 How do you select floorstanding speakers? Choose a configuration. Floorstanding speakers are available in single or multi-channel options that include a sub-woofer. Some configurations will include a home theater system that allows you to control the various units. Choose a color. Some floor standing speakers are available in various wood finishes while plastic and metal options are available in different colors. Choose a connection option. Bluetooth and wireless connections reduce the amount of wires used in a setup. Wired options will connect to your audio system. Select a brand. Brands will have different configurations available, and several unbranded options are also offered. What types of speaker designs are available? Speakers will vary in the types of sounds that they can produce. Three-way audio-speakers will have separate drivers for the high, mid-range, and bass frequencies so that a single unit can produce multiple sounds. The bass/woofer will be the largest part of the floorstanding speaker and will be used for sounds such as drums or explosions. The tweeter, on the other hand, will be the smallest part of the system and will handle high-pitched notes. The amount of space allocated to a section will determine the sound range it can produce. Two-way audio-speakers won’t have the mid-range system. Speaker systems will typically have a single subwoofer. A subwoofer is responsible for producing the low pitch/bass sounds from your system. The enclosure will generally have one or more woofers and will augment the bass from the main speaker-units. What types of speaker configurations are available? Single. This style uses a single unit to play the audio from your audio system. The single configuration includes soundbars and portable options that can connect wirelessly or with an audio cable. Multi-channel. This style can range from 2.1 up to 5.1 systems. The first number will denote the number of main channels or speakers in the system. The second number will show the number of subwoofers used. A 5.1 channel would use a center channel for voices and a pair for the music and effects. The last two units would provide additional effects to provide the overall surround-sound effect. 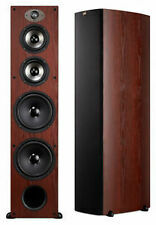 Tower speakers are large units that are able to stand on their own. This style comes in pairs and commonly has separate drivers for the bass, mids, and tweeter sounds. Tower speakers are highly visible and often have different styles like wood finishes to accent other pieces in the room or home theater.